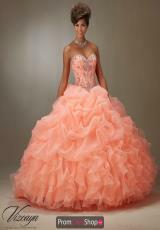 Vizcaya 89075 is a dramatic ball gown with a sweetheart neckline and ruffle skirt. The neckline and bodice are adorned with color coordinated beads and sparkling silver stones. 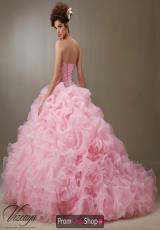 Organza skirt is voluminous and perfect for quinceanera, cotillion and prom. The back is straight across and features a corset lace up that ensures a perfect fit. This dress includes a matching bolero jacket.